Enriched with natural ingredients such as beetroot and tamarind, this soap bar helps maintain a youthful looking glowing skin. 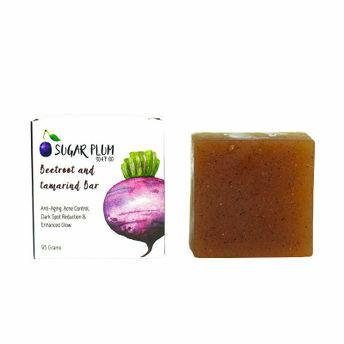 Sugar Plum Soap Co. Beetroot Tamarind Bar combines the benefits of essential oils of vetiver, ylang ylang and lemongrass with pink Brazilian clay and vitamin E oil, to make your healthy and nourished. This soap is extremely beneficial in reducing dark spots, dark circles, acne scars and many more. Beetroot is rich with anti-ageing properties that keep wrinkles and fine lines at bay. This soap is very effective on active acne. A bathe in it will give you a beautiful glow.